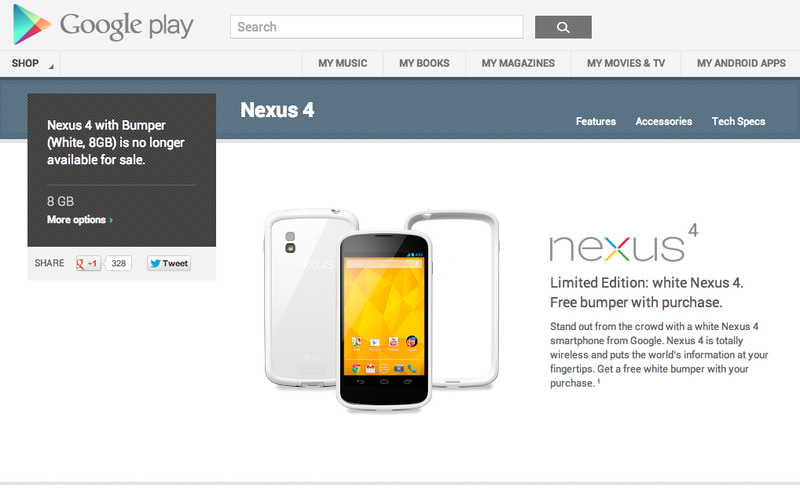 The promo for the white Nexus 4 (8GB) that was coupled with a free white Bumper on Google Play is no longer for sale as of today. We’re a bit confused, because you can still pick-up the 16GB white Nexus 4 with Bumper, along with both black versions of the phone, just not this white 8GB model. If the promo for the free bumper is running out, why not sell the phone by itself? Maybe they will? As of this moment, they aren’t. I guess “limited edition” wasn’t a joke. We should mention that these Play store listings change quite often, however, they rarely ever switch to “no longer for sale” unless something has permanently changed. We’ll be watching the other pages closely. If you haven’t yet, be sure to check out our comparison of the white Nexus 4 to the black Nexus 4.